Every year millions of tourists use the French autoroutes to reach their holiday destination. The motorways in France are in perfect condition and except for the Paris and Lyon bypasses, traffic jams are usually not too bad. Avoid the black Saturdays, when all of France is on the move. in 2019 that will be 3 and 10 August. You have to pay toll on most motorways, and for a ride from the North to the South of France, that will be a considerable amount, especially if you are traveling with a caravan. As of July 1, 2018, a maximum speed of 80 km/h applies to most roads outside built-up areas. A maximum speed of 90 km/h applies only on roads with central separation. On motorways, the maximum speed remains 110 or 130 km / h.
Safety vests: make sure you have reflective safety vests in the car, which are mandatory for drivers and passengers – not only in France, but also in many other holiday countries. Breath tester: in France, possession of a breath tester (éthylo test) is no longer mandatory since 2018 (blog article). Cyclists on the road: in France, as a motorist, you are obliged to maintain a space of at least one meter apart when you overtake cyclists. That means that on a road with a solid center line you sometimes cannot overtake the cyclist. Overtaking narrowly is severely punished. Amsterdam - Bordeaux via Paris: € 72.20 (109.30) (to Biarritz € 83.30 (125.90). Amsterdam - Lyon via Luxembourg: € 31.50 (49.00). Amsterdam - Lyon via Reims: € 42.10 (63.70). 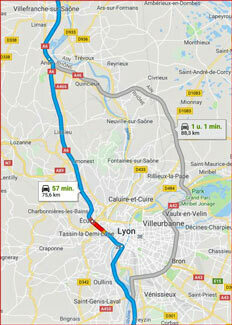 Amsterdam - Nice via Luxembourg and Lyon (Autoroute du Soleil): € 73.80 (115.10). Amsterdam - Nice via Germany, Switzerland and Italy): € 37.10 (60.50) plus Swiss vignette approx. € 35 (70). Amsterdam - Perpignan via Luxembourg and Autoroute du Soleil: 72.60 (€ 113.10). Amsterdam - Perpignan via Paris and toll bridge Millau (A71 / A75) € 74.30 (€ 113.80). The Millau viaduct costs € 10.40 (€ 15.60 with caravan) per passage in July and August, € 8.30 (€ 12.40) in the other months. The Duplex tunnel on the west side of the A86, the outer ring road around Paris, has a variable toll rate from € 1 to € 11, depending on the time, and is only accessible for vehicles <2m that do not run on LPG. From the north, this tunnel is not an obvious option for most destinations in France. The Pont de Normandie at Le Havre costs € 5.40 (€ 6.30) and the Pont de Tancarville 15 km inland from it € 2.60 (€ 3.20). The bridge over the Seine in Rouen is free. For the bridge to l’Île de Ré the toll is € 8 per car with or without caravan, € 16 from 20 June to 11 September. The return passage is free. Paying toll in France is quick and easy with a credit card; you choose the lane with the sign CB (Cartes Bancaires). The toll gates with the CB symbol have payment machines and you can only pass here if the height of the car and any trailer is less than 2 meters (class 1). With a caravan you can’t pass through these ports because the machine cannot calculate the higher rate. First you put the toll ticket in the slot and then the credit card, which reappears almost immediately. You can drive straight on, or press the button for a receipt. The lines at these automatic gates are almost always much shorter than at the manned gates. Note: paying with a debit card (bank card with only the Maestro logo) is not possible at most toll stations in France, only with a credit card (Visa Card or Mastercard) or cash! If you use the French toll roads regurarly, then the purchase of a toll badge can be interesting. You stick it behind the windshield and then you can pass most toll stations at a footpace via the leftmost toll booth (orange t) or at 30 km / h (orange t and sign 30). This saves time and hassle with credit cards and toll tickets. You will receive a monthly invoice at home and the toll amount is automatically deducted from your credit card account. The costs are € 1.70 for each month that you use the badge. 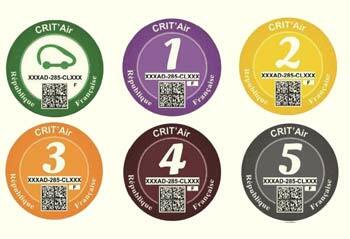 The toll badge is available at automobile clubs or online at the French toll company APPR (French). Beware: there are also websites (such as tolltickets.com) that offer toll badges for much higher prices! In 2019, Saturdays 3 and 10 August will be considered as “black Saturday” on the French motorways, because many French families (and foreigners) will then go on holiday and the traffic jams, especially on the autoroutes to the south, will be horrendous. Saturday, August 24 will be extremely busy in the south because of returning holidaymakers. For winter sports enthusiasts, it will be very busy on Saturdays 16 and 23 February 2019 on the roads to the winter sports areas. Bison Futé gives a pdf overview of the busiest travel days in France in 2019 and also gives current traffic jams on the autoroutes. If you have to pass Paris from the north in the direction of Bordeaux and Orléans, you have the choice to follow the always overloaded Boulevard Périphérique or the A3 and A86, a slightly longer route with a high chance of traffic jams. For most motorists, the second option is the easiest -- merging traffic and reckless motorcyclists on the Boulevard Périphérique make driving on this route no fun. Attention: the signs “Bvd Périphérique exterieur” refer to the western outer ringroad, counterclockwise, and the signs “Bvd. Périphérique interieur” refer to the eastern inner ring, which runs clockwise from the north to the east. The maximum speed on the Bvd. Périphérique is 70 km, and frequently 50 at road works or because of smog. There are speed cameras! Driving on the A6 from Luxembourg / Dijon or Paris in the direction of the Mediterranean, you have to make the choice to follow the A6 / A7 through the city of Lyon with the infamous tunnel the Fourvière or to take a 18 km longer route via the A46, which is signalled on the traffic signs as the route to Marseille. In general it is advisable to choose the A46 at peak times, although it is quite possible that you will also get stuck on the A46 in a traffic jam. By the way, there are plans to free Lyon of through traffic, so the problem will eventually resolve itself. Like elsewhere, in France the number of speed cameras is growing rapidly. Previously they were indicated at a few hundred meters distance by signs with the text Pour votre Sécurité, contrôles automatiques, but these signs have now been lreplaced by signs with the text Pour votre sécurité contrôles radars fréquents, with the speed camera in a zone up to a few kilometers after the sign. Navigation equipment that alert drivers to speed cameras is prohibited in France. If you enter a route in the Viamichelin route planner, you will see in which zones you can expect speed cameras. The zones are 4 km long for motorways, 2 km for other roads outside built-up areas and 500 m within built-up areas. Like cities in Germany, Belgium and the Netherlands French cities have introduced environmental zones. For the time being an environmental sticker (Crit’Air) is only compulsory in Paris within the périphérique (inner ring road). You have to stick it on the lower right of the windscreen. In other French cities and areas there is a jumble of regulations, depending on the air pollution. Driving restrictions can be issued for motorways too. It is therefore wise to purchase an environmental sticker in advance to avoid the risk of not being allowed to continue your journey in France. The environmental sticker can be ordered online at the French Ministry of the Environment and costs € 4.21, including shipping by post. It takes about a week to receive the environmental sticker. The color of the sticker and the corresponding restrictions depend on the emissions and the age of the car.